Woohoo! It's the summer holidays and I couldn't be happier. As much as I do appreciate my education (well most of the time...;)) I am really looking forward to spending my days sunbathing (hopefully the British weather will hold up, fingers crossed!) instead of being stuck in a classroom all day. 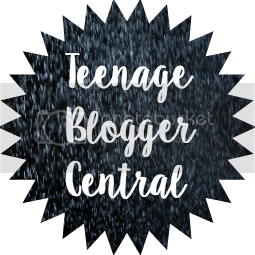 Besides, I'm really starting to gain momentum with writing blog posts and I'm planning to be updating 2-3 times every week this summer! At least every Tuesday and Thursday, and if you're lucky there might be a bonus post on a Sunday as well. Onto the main topic of today's post. Recently I've been trying really hard to become more eco friendly, however it often isn't easy when we live in such a wasteful society - especially when you're a teenager (and therefore most likely not the person making most of the main decisions about what goes on in your house.). 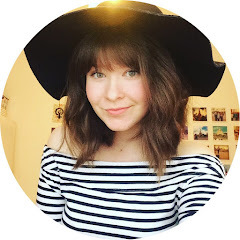 Sooooo, I've compiled a list of 5 EASY ways you can be a little bit more environmentally friendly as a teenager - ENJOY! Pretty self explanatory, but important none the less! You can actually change your printers default settings to print double sided instead of single sided. This is such a useful tip, especially when printing out long essays or stories etc, you can essentially HALF the amount of paper you're using! By having a 5-10 minute shower instead of having a bath you could save approx between 10-20 gallons of water every time you wash. That is the same amount of water you should be drinking in about 40 days (not that you should be drinking bath water though...:))! This is something super simple that you can do to reduce how much you are throwing away. If you take a packed lunch with you to school, try putting everything into tupperware containers (without using foil or cling film!). I have a really great lunchbox (I can't remember where I bought it - sorry!) that has about 3 different sections in it. I might have pasta salad in one section, some trail mix in one and some grapes in the other or something like that. Try to avoid foods that have lots of packaging like crisps or chocolate bars (especially since these are usually individually packed inside a bigger multipack bag!). Most foods that have less packaging like the ones I suggested are usually less processed and a lot healthier as well, so you'll be doing yourself a favour too. Another REALLY easy thing you can do is to carry around a reusable water bottle or flask with your chosen drink instead of constantly buying new bottles of water. There is nothing wrong with tap water and you might actually save some money doing this as well! If you are really serious about creating less waste, you can even take your own flask into coffeeshops when getting a takeaway and ask them to put your drink in there instead of a paper cup. I know, we've all heard this one a million times before, but that's only because it's true. Did you know that by walking or biking to school you could save 328 pounds of Co2 every year and that by getting public transport you could save 984 pounds of Co2 every year - that's the equivalent to driving 350 or 1,050 miles. If you can't walk or get public transport you could try setting up a car share with some of your friends as this will also reduce your carbon footprint. When I wanted to start becoming more environmentally conscious I calculated my carbon footprint and found it to be really useful! 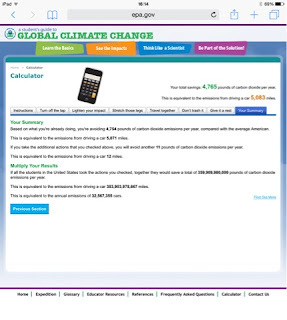 This specific calculator: http://www.epa.gov/climatestudents/calc/index.html#calc=instructions is particularly good as it is set out like a survey and is tailored to teenagers and young people. 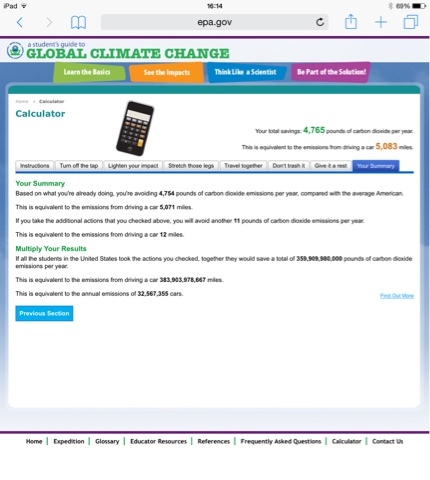 Below you can see a screenshot of my carbon footprint results which I was quite happy about, although there are DEFINITELY things I still need to work on. By calculating your carbon footprint you can see really clearly how much waste you are creating and how much waste you are saving. I know that for me it definitely gave a really good starting point to figure out where I was making mistakes! -Be A Source Of Inspiration! Encourage your friends and family to be more conscious about environmental issues, a lot of people wrongly assume that just because we aren't directly feeling the effects of global warming and the suchlike right this second, that it's never going to happen. Scientists now predict that unless we drastically change our ways, global warming could be well under way by 2050. One person can't always make a difference, but lots of people together can, so get people involved! Tell them about what they can do to reduce their carbon footprint and speak to people about why it's important to be more environmentally friendly. In situations like these, nothing works better than good old fashioned word of mouth! What a great list! I am quite environmentally friendly, and most of these things I already do, but there are always things that I have to learn about! Thanks!